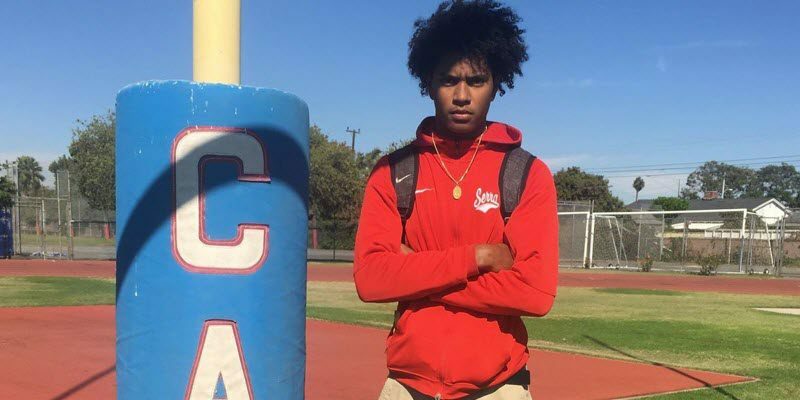 Oregon football recently augmented its 2018 recruiting class with the late addition of Bryan Addison from Gardena, California. 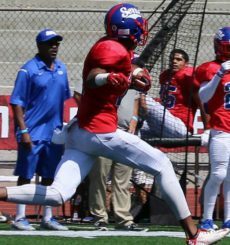 The versatile defensive back/wide receiver from Junipero Serra High School was rated the No. 1 Athlete (247sports.com composite rankings) in the country in this last recruiting cycle. Serra High School has long been considered a pipeline to USC with notable alumni Robert Woods, Adoree Jackson, Marqise Lee and George Farmer – but the Trojans did not even make Addison’s Final Four. He chose instead cross-town rival UCLA, committing to the Bruins on December 10, 2017 over Washington, Arizona State, Michigan, Nebraska, Ohio State, Oklahoma and a host of others. However, due to a issue with a test score, Addison’s application for enrollment into the University of California (Los Angeles) slowed to a crawl. The incoming freshman feared if he was not cleared quickly, he would not have the opportunity to apply anywhere else. He requested his full release, which was unconditionally granted on July 19, 2018. He subsequently focused on four schools (Arizona State, Nebraska, USC, and Oregon) to find a home in the next phase of his life. Re-opening his recruitment lasted all of five days as he quickly committed to the University of Oregon in time for fall camp. Addison has been listed in the media as 6-foot-4 to 6-foot-5 and between 176 and 190 pounds, depending on the source. The most relevant source at this point is the official Oregon Ducks roster, which lists him at 6-foot-5 and 180 pounds. 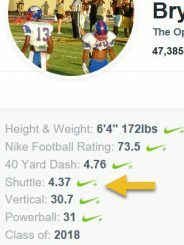 ESPN.com lists his 40-clock at 4.76, a 4.37 20-yard shuttle, and a 30.7 vertical jump. Typically ESPN posts these results from a officially sanctioned event such as The Opening Regionals where the athletes are measured and tested without bias. I checked all 12 regional results from the spring of 2018 and could not find the origin of these results. Furthermore, I checked the two most logical locations (Los Angeles and Oakland) from 2017 and he did not appear on either of these posted results. I don’t believe these results came from either the 3-Stripe Camps or the Adizero Combines that Rivals.com produces, as the results for 2018 apparently have not been posted. His Hudl.com video lists the rest of his test results, and I believe these are correct, as they match up with the partial results that ESPN reported above. I have not seen anything in the media with respect to his arm length or hand size; however, for an athlete of his size (6-foot-5), his arm length should be 33″ to 34″ and his hand size should be 9-1/4″ to 10-1/2″. Addison possesses the length, body control, elite hand-eye coordination, and “want to” (desire and work ethic) to be a great player. I rarely get into intangibles in talent evaluations because they are difficult (impossible) to quantity; however, Addison’s will to compete and win on every snap of the ball jumps out at you on tape. He is simply a great football player. Addison in an “Oklahoma” drill during a game. He is tough and physical at the point of attack. In the video above, Addison flashes his wingspan and his ability to “climb the ladder” as he one-hand catches a touchdown in the corner. The ability to “windmill” is a rare skill. His height plus his arm length, plus his vertical jump puts him well over 10’0 at the high point. Very impressive. Addison flashes his range and again climbs the ladder on an interception at the goal line. His length and wingspan compress tiny throwing windows. Forcing a quarterback to be finer in his accuracy will yield more interceptions. Addison, in the video above, uses his length to come over the top for the pass break-up. He has the ability to take away the lower branches of the route tree, such as sideline patterns or back shoulder fades. His fluid transition from back peddle to the turn and run, for an athlete of his length, is rare. Addison demonstrates focus in tracking the ball. He plays the ball in the air, rather than the receiver. Excellent sideline-to-sideline technique. The drill above tests the ability of the athlete to: (1) Quickly locate the ball, (2) Track it with hand-eye coordination, and (3) Catch the ball away from his frame (“plucking” — not body catching). Addison flashes his hand-eye coordination as he turns, locates the ball, and pulls it it with one hand. The great ones make it look easy. Premier receivers obtain separation with a variety of moves, and then catch the ball even though they may be interfered with. Addison, in the clip above, catches the ball with one hand with a defender draped all over him. Elite technique in every facet of the drill. Kenny Easley from Chesapeake, Virgina. He starred at UCLA and then went on to a Hall of Fame career with the Seattle Seahawks. Easley, at 6-foot-3 and 205 pounds, was a big rangy back-end guy known for big hits and he could cover sideline-to-sideline. Addison has the same frame, skill set, and demeanor as the great UCLA safety. By the way, it’s great to hear Keith Jackson and Frank Broyles again in the vintage film clip above. Addison has the length and ball skills to excel on either side of the ball. Though he has a big upside as a wide receiver, I feel his best position is free safety. His best attributes of length, wing span, twitch, ball skills and competitive nature combine to present an elite prospect. He has the talent to anchor the back end of a defense not only at the collegiate level, but in the pros as well. Admittedly, an analysis of his metrics (testing results) leaves you underwhelmed. They are pedestrian at best. A 4.76 40-clock and total score of 73.5 are average results. So what makes him an elite prospect? Although a shuttle time of 4.37 is very good for a 5-foot-11 wide receiver such as Mycah Pittman (4.39), it is elite for an athlete as long as Addison. 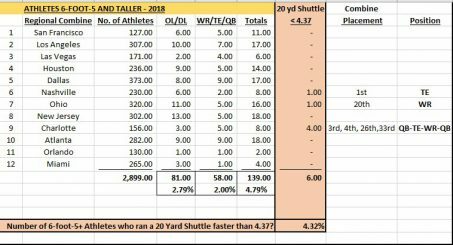 I looked at athletes 6-foot-5 and taller who have the twitch to run the 20-yard shuttle in 4.37 seconds or faster. I found that 4.12% of the athletes who participated in The Opening Regionals across the country met that criterion. Out of nearly 3,000 of the very best high school football players in the 2018 recruiting class (at 12 Nike-sponsored combines), there were only six athletes with a shuttle time faster than Addison’s. Two were quarterbacks, two were tight ends and two were wide receivers. None were defensive backs. What does this mean? Addison has the rare ability to transition from his back peddle, cross over (“flip his hips”) and run at full speed in less than two steps. That, coupled with his 6-foot-5 frame and his wingspan, actually makes him faster than he tests at in a straight line. Addison is a premier football player. He has the size and skill-set to play and excel either wide receiver or safety … or both. He is the third member of the Oregon Ducks’ 2018 recruiting class that I have seen “wind mill” (one-handed catch in a sweeping motion) a catch during a game, joining Spencer Webb and Isaah Crocker. This is a rare (elite) skill that requires great hand-eye coordination, athletic ability, and big “sticky” hands. Most collegiate programs would be thrilled to have one guy on the team that has done that. Oregon has three in one class. In my opinion, safety is his best position. He has unheard-of size at 6-foot-5, and we should expect him to put on 20 to 25 pounds of muscle to hit a play weight in the 200 to 205 pound range. He has a nearly 7-foot wingspan, elite ball skills, and is very physical either down in the box or on a deep go route with a receiver. His competitive nature jumps out at you on tape. He wants to be great. The sum of these traits makes him the best in this class with the highest ceiling going forward. 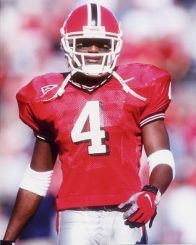 It has been about 20 years since Roland “Champ” Bailey, Jr. set the college football world buzzing every Saturday afternoon, leaving fans wondering how many plays he would participate in on offense, defense and special teams. He was a rare athlete who could play (and excel) on both sides of the ball. Certainly Addison has the ability to do this, and do it very well. He not only will be the best safety to ever play at Oregon, he has All-Conference and All-American ability and very high pro potential. I don’t know if he is a once-in-a-generation player, but he may very well be.